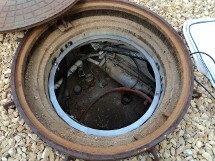 In addition to sewer manholes and storm inlets, SEWERLOCK offers a wide range of utility locks for underground utilities that include communications, power, lighting and signal junction boxes, vaults, cable, phone, and data wiring designed with protecting against wire theft, always with public safety in mind. Made in USA, we ship throughout the world. SEWERLOCK security barriers are custom manufactured to lock underground utilities in manholes and communication vaults for cables and other power systems. The subframe and inner cover prevents vandals from tampering with wire and cables. The barrier can be installed into any size or shape utility opening without modifying the structure or cover. The stainless steel products will not interfere with your power and communication wiring systems. All of our products provide security so people cannot fall into unprotected manholes while also preventing items from being thrown into them. Our junction box locks work independently of the existing junction box and is made to fit your junction boxes. Made of stainless steel, they are built to last and prevent wire theft. SEWERLOCK's customers are serious about security and include the military, state, local, and Indian Agencies such as the FAA, Edwards AFB, Otis AFB, Fort Meyer AFB, Henderson Hall, and China Basin and Ordinance Test Center. Also included are Verizon, Verizon Wireless, AT&T, and other communication companies and their security contractors. Contact us at (888) 502-2484 in the USA, for state-of-the-art security locks.